Imprinted 3.875 x 3.875 x 1.9375 adhesive note cubes 1 color, 1 design is all set to become an extension of your brand. 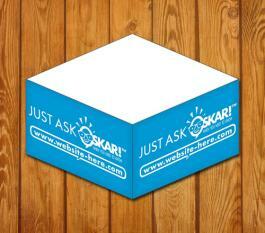 Personalized memo cubes can be customized with your brand information on sides in 1 color and 1 design before gifting. If are adamant to make your brand information feature, then get it customized over sheets, by ordering these personalized note cubes in bulk. You can stay assured that these custom sticky notes are going to function as colorful billboards. Request a quote to know wholesale savings for these custom 3.875 x 3.875 x 1.9375 adhesive note cubes 1colors, 1 design. * Price includes 1 standard colors screen printed SPOT and 1 side design. Product Size: 3.875 in. x 3.875 in. x 1.9375 in.